Nine years ago, two dozen people gathered in a quarry to listen to home DJs and share a picnic to raise money for charity. Today, fifteen thousand people descend for the same event. Arriving later on Friday afternoon, the full car park already begs the perennial festival question, “can we get a good camping spot? Should we have hired a troupe of mercenaries to carry stuff miles and mark our territory?”. It turns out no, as the site is relatively small and the queues non-existent thanks to good organisation. A short trek to the wristband exchange, a few directions, and Soundsphere is on the way to pitch somewhere not at the bottom of a hill, not too near to portaloos, not too far, not on rocks, in an easy-to-find spot, not too close to pathways… who knew camping was so complex? A quick fight with tent poles later, and the arena calls. 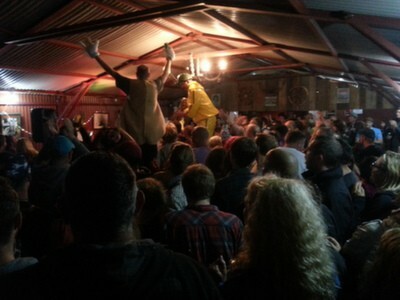 Wandering through the site, the effort that has gone into putting together a detailed festival does not go amiss: themed bars are in abundance, such as the Slippery Saddle Saloon – a Wild West bar complete with a wooden street facade of shops like a General Store for those quick drink purchases. Inside is a small stage, host for the weekend to a variety of country and folk acoustic acts, plus a few mainstream tracks to be blasted out later on during the DJ sessions. There is some satisfaction in swinging through the double doors, pretending to be a cowboy, sitting on the saddle seats at the bar and drinking in the first beverage of the event atmosphere. More wandering draws our ears to The Giant Squid, the third-largest music stage and the one hosting heavier, rockier sounds. Leeds band Brawlers are finishing up their set, and the energy of the crowd is already high, the tent full and the tracks delivered in the same forceful way as every other live performance they’ve given. Brawlers are loud, energetic, and always consistent in providing a good time. Staying in the Giant Squid for now, the next act generates some excitement: Fight Like Apes deliver their Dublin magic to Y Not, with vocalist Mary-Kate seeming to be from another world. Instead of distancing the audience, she takes them with her to wherever she comes from: ethereal gut punches come from synths, guitars and *that* voice. Taking over the stage, at one point climbing atop the (now seemingly precariously balanced) speaker, Mary-Kate knows how to work an audience and the set feels too short for the quality of sound and enthralment delivered. Razorlight are the last stop of the live music day, and while it’s great to see such a crowd and hear familiar tunes, it feels dated and lacklustre. The expectation of some new material falls short, and the classics bring a sense of impatient familiarity. It’s time for some new stuff, and the crowd feels it, too. The rain, oh God, the rain, make it stop. The trouble with festivals is that they tend to be in the middle of nowhere, and with Y Not positioned atop parts of the Peak District, it’s a little… exposed. A constant downpour all morning, before any music begins, is a test and a half for the mettle of revellers and tents alike. Around 11am, Soundsphere gives in: we’re not going to let a little bit of water stop us. Wellies wriggled on, the trek to the arenas begins. What is actually a pretty short walk feels a little like King Lear’s madness on the heath: blowing gales, sheet rain, questioning of the self. But soon after reaching the main arena, it lessens enough to not risk drowning when yawning away the morning cobwebs. The site is pretty empty, and the fields are already threatening squelches of quagmire proportions. Soundsphere visits one of the few stalls already open and offering hot beverages, and once caffeine is imbibed, the rain has let up a little again and the music is ready to roll… Beasts are the first stop, bringing technical ability without great musicianship. The vocalist and lead guitar feels to be battling with the bassist, and the disjointed performance takes away from the technically accomplished set of heavy bass and decent song structure. 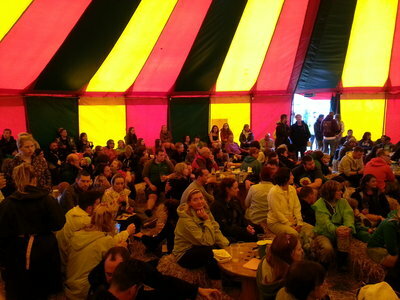 Crusading across the muddy arena site to investigate the smaller acoustic tents, a crowd extending out of The Hog and Saloon bar tent catches the attention of soggy festivalees in the area. A full crowd is warm, happy and sampling many regional ciders to the tones of Jonathon Eagles, a talented and funny solo acoustic artist. As the brief dry spell turns to torrents, this little haven glows from the yellow canvas, and Eagle’s easy banter and bright tunes lift energies (while the humid tent lifts the frizz of many a head of hair). Somewhere in the middle of the crowd seated on haybales, a mother is entertaining a toddler by blowing bubbles with a wand that looks like a flower, and the simple act of watching them float above our heads unites everyone in a happy state. Rain? What rain? Next up is an artist simply entitled, Harriet. After telling one or two appalling jokes – not even so-bad-they’re-good – she cracks out a standard cover of Jolene before delivering some of her original songs. While the safety of the tent is appealing, Harriet’s sombre songs are more set for the evening (instead of a mood booster on a Saturday morning), and Soundsphere promptly escapes the tent to prevent further aural flagellation. After a spot of food (zebra or springbok burger, anyone?) it’s back to the stages for the afternoon onslaught of good noise. 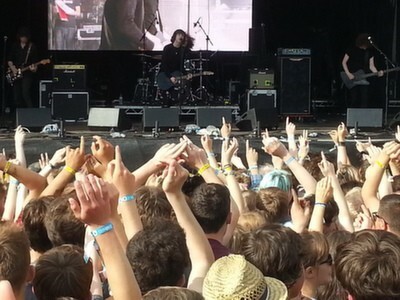 The sun comes out for the largest crowd yet, rammed into the main arena for Catfish and the Bottlemen. A band who have seemingly appeared from nowhere, it’s taken seven years of hard graft and persistent gigging for them to receive national (and international) recognition. Only a few months ago, they delivered an intimate set at The Duchess in York, and now they are playing to ten thousand people. The crowd gets into the swing of it, and at one point so many people sit on other shoulders all Soundsphere can see are backsides covered in various stages of what we hope is mud. The energy is incredibly high, with familiar tracks, Fallout and Kathleen, sung at top level by everyone. It is the standout set for the entire weekend, and the band seem to know it too – genuine, humble appreciation for the crowd seeps through every note. The threat of an electrical storm means the set is cut short; it could easily have gone on twice as long and continued to perpetuate the same energy. It’s what people have been waiting for, and felt like the kickoff of the true festival spirit. Squelching through the quagmire, it’s back to the Giant Squid stage for next rock act, Lonely The Brave. Coming from such a high-octane audience in the main arena, the audience here feels a little lacklustre to begin with, but soon gets going with many an intense shoe-gazed head-bob. Their tight cross-melodies between lead guitar and bass create a texture to compliment the vocals, and as the set progresses the intensity deepens and the tent fills with passers-by drawn in by the bass licks whomping out every now and then. A sunny stroll makes all the difference, as Soundsphere moseys from the darkness of the Squid over to a small tent on the other side of the site for a completely different experience in the form of Lem and The White Fire. 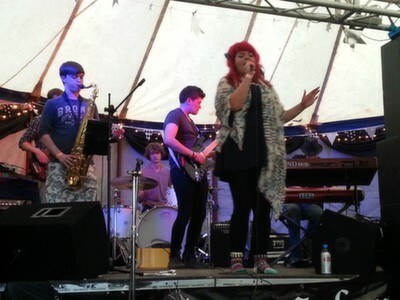 A six-piece jazz blues band from Chichester, the shock of red hair on the eponymous Lem is as standout as her vocals. Rich, bluesy, pin-you-to-the-wall notes are matched with incredibly skilled technical work by the Hammond and keys player, backed up by live brass and guitar. The Cafe Salem tent, a laid-back haven with Persian carpets and the homely smell of vegetarian curry cooking in the corner, begets a lively audience, who dance enthusiastically to hyped swing beats. The crowds start moving, and it’s time for hotly-anticipated The Fratellis over in the main arena. A full, drunken, sun-loving crowd turns out for the evening set, and the raspy-blues vocals of Jon fill pits of stomachs with that irresistible urge to dance. While most of the crowd seems to be unfamiliar with any of the songs, Chelsea Dagger soon begins and takes forth swaying arms everywhere, lifting the mood from happy-but-nonchalant to full-on-festival-feeling – which feels strange, as while it is their most well-known song, it is not representative of their usual Glaswegian indie tracks. Later on, the strange booking of Dizzee Rascal delivers an intriguingly large crowd for an artist so off-kilter with the rest of the festival bookings. Armed with a backing track and the occasional extra singer, the usual chart hits are belted out alongside a laser show. It feels empty and out of place, but everyone seems to be having a good time anyway, and as the live music ends, the dance tents begin. Wandering around site after dark, Soundsphere go to ask the grannies in the tea tent to tell a story. It turns out there’s a hidden doorway in the back of this tent, leading down the rabbit hole to a rave room – a nice touch, and another example of the exceptional planning of the event. Every tent belts out difference dance beats, while the silent disco starts up in the Giant Squid. The last-standing entertainment means that, close to 3am, all that can be heard are the joyous (if not tuneful) songs of a crowd united in their own little headphone-bound worlds. After lazy-nap mode of the Sunday morning, Soundsphere heads to the main arena with great anticipation. 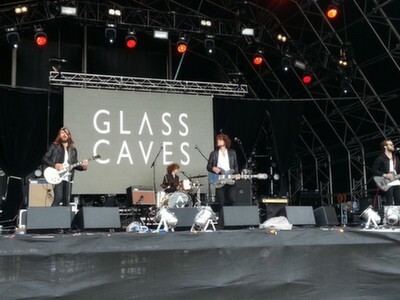 York’s own Glass Caves opens the main stage, drawing a surprisingly large crowd for the first act of the hangover day. The distinctive lead vocalist is complimented by the lead guitarist’s falsetto on some songs, while the underrated bassist casually rocks out and the drummer pulls faces of cartoon proportions. The energy is just what’s needed, and puts the mood high for what’s looking to be a dry day – hurrah! With the previously impossible mud-mires already firm underfoot, it’s a good opportunity to wander and master the ancient skill of people watching. Some are still in fancy dress from the previous day, while others nurse tender heads with hair of the dog. A man helps his friend in flipflops to navigate the small remaining patch of muddy puddle. A brave soldier sits in the ever-faster spinning gyroscope without ever reuniting with his breakfast bacon barm from earlier. Energetic and optimistic challengers take on the roller disco with aplomb. A little later, the smooth tones of Luke Sital Singh brings a big crowd to The Quarry tent, a chilled set with a real groove perfect for Sundays. Reminiscent of a cross between the softness of Damien Rice, the elation of Bruno Mars and the classic sound of Bon Iver, it’s a confident and mellow set.